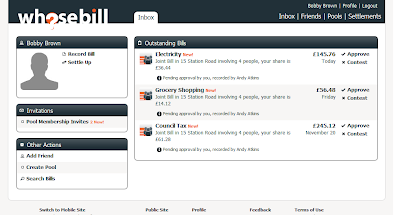 Issues with entering new bills on BillMonk? We've been hearing reports from some of our new users and others on the web, that they have been unable to enter new bills on the money management site BillMonk. For those of you not in the know, BillMonk is one of the oldest social money management tools out there, and in some regards an alternative/competitor to WhoseBill. Just to be clear up front, this is not a BillMonk-bashing post! As one of the most popular and longest-surviving web apps out there focussing on social money, we have a lot of respect for BillMonk, and tip our hats to what they have achieved over the years. Whilst BillMonk was not the original inspiration for WhoseBIll (a 15-year old spreadsheet was! ), they certainly share some common goals and features, and so the purpose of this post is to help any previous BillMonk users looking for an alternative solution. We sincerely hope that BillMonk is fixed soon, as there is nothing worse for a user than finding the system you rely on no longer works - especially when it comes to sorting out money! What we'll do here is describe how the WhoseBill and BillMonk features compare, as a guide for those looking for an alternative. When it comes to enterting new bills, WhoseBill and BillMonk have fairly similar terminology. 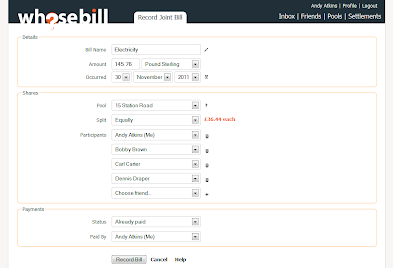 In WhoseBill, Joint Bills are the equivalent of BillMonk's Shared Bills and Itermised Bills - the feature sets aren't identical, but WhoseBill's Joint Bills allow you to add simple or complex bills shared between multiple people. We're always looking to add new features, so if you've just moved to WhoseBill and are missing a feature from BillMonk, please email us at support@whosebill.com and we'll put in on the list for future development. Loans and debts work very similar between the systems, and Repayments in WhoseBill are the rough equivalent of Payments in BillMonk. In WhoseBill, we also have the concept of Settlements which automatically generate the most efficient set of repayments based on all the outstanding debts, in any currency! 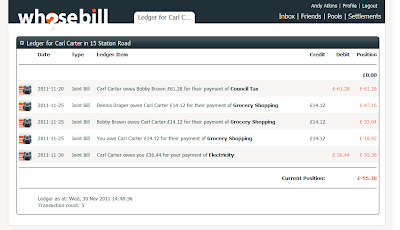 One thing that may be new for previous BillMonk users, is that in WhoseBill bills can be entered before they have actually been paid. This helps to keep track of the household bills that need to be paid by someone in the house, or to make requests for loans or repayments. When entering a bill, you can choose who paid (single person or multiple), or leave it unpaid to put it in everyone's inbox for attention. 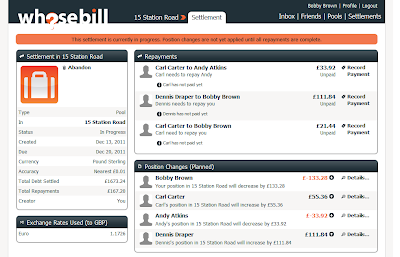 Both WhoseBill and BillMonk allow you to invite your friends to join by email so that you can start tracking debts between you. 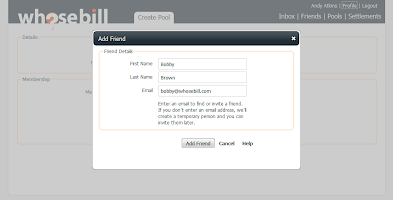 However, WhoseBill also lets you add friends without actually inviting them straight away. This can be really useful if you paid for something with a group of friends, but there were some friends of friends present for whom you don't yet have an email address. 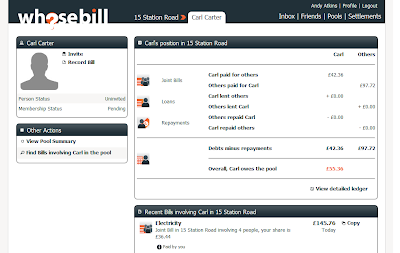 WhoseBill lets you add the bill straight away, creating a new friend with just a name, and you can return later to invite that person to signup, or connect with them using their email address. One thing that is certainly different between the two systems is the way that WhoseBill Pools and BillMonk Groups work. 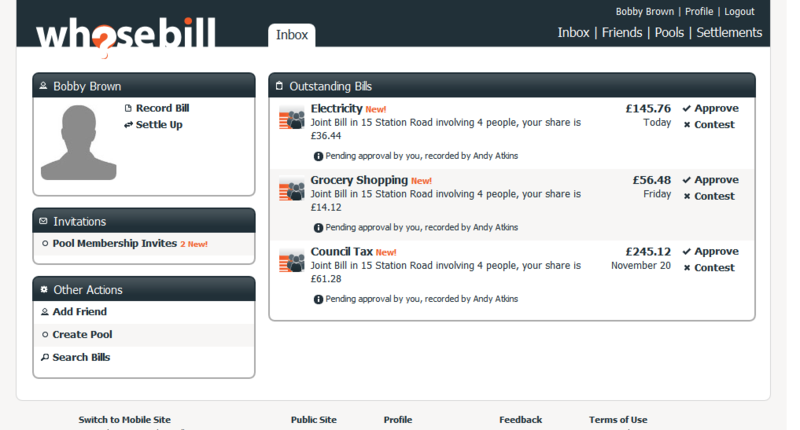 In BillMonk you can setup groups of friends to make it quicker to add bills involving the same people, such as when living in a share house. In WhoseBill, we use Pools for similar situations, but Pools are much more powerful as they automatically offset (think BillMonk shuffling) debts between all the people in the pool. 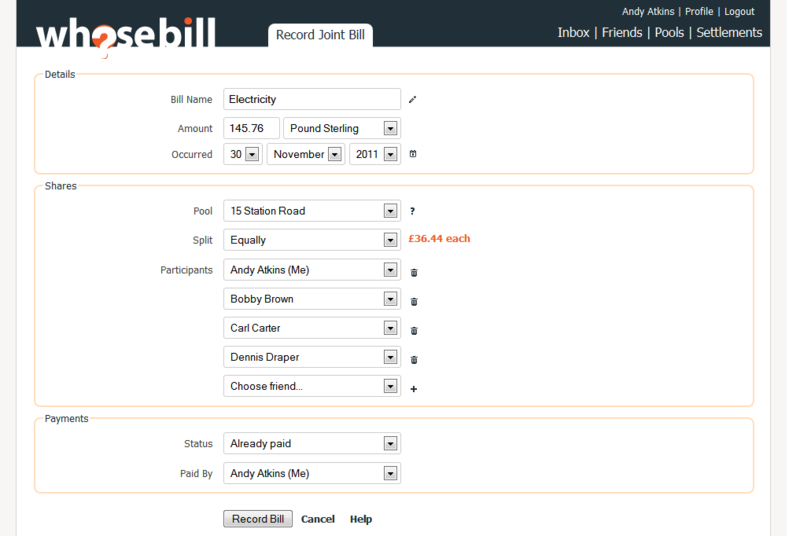 Whenever you add joint bills, loans or repayments to a Pool in WhoseBill, the debts associated with that bill are automatically offset between the member of that Pool. This means that you end up with a single financial position in the pool, and can stop thinking about which individuals you owe money too, but rather than overall you owe (or are owed) a certain amount collectively. 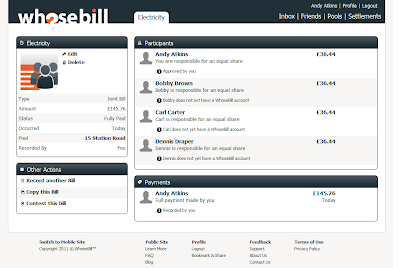 WhoseBill does all the maths automatically so you don't need to shuffle the debts manually - we think it is a much easier way to manage group finances, and saves our users a lot of time. If all of this sounds complicated, WhoseBill can also show you a complete ledger to explain your position in a Pool, allowing you to check the maths if you want to! Finally, Settlements in WhoseBill Pools are super-efficient as they calculate the simplest set of repayments that cancel out all of the outstanding debts in the pool. This means that even with hundreds of bills in multiple currencies, involving any number of people, settling up can usually be performed with only 1 or 2 repayments by the people that owe overall. One other feature that may be of interest to previous BillMonk users, is that currency conversion is built right in to WhoseBill. You can enter bills in any major currency (if we don't have yours, please just let us know), and WhoseBill automatically converts the associated debts to your preferred currency, based on the current average market exchange rate. So even if you go on holiday abroad, or even a round-the-world trip, everything can be automatically converted to the currency of your choice. When it comes to settling up, WhoseBill lets you choose the currency in which to make repayments, and debts in all currencies are converted and cancelled out automatically, once the equivalent repayment is made. 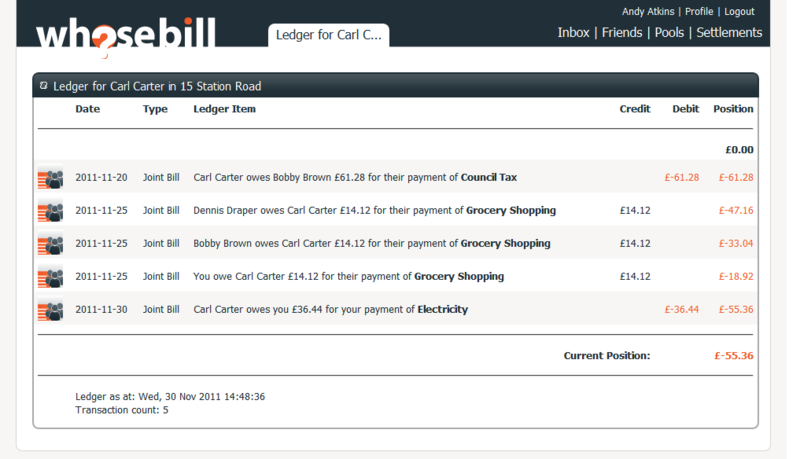 We have big plans for WhoseBill and are always looking at new features to add. If you want to learn more about the WhoseBill, visit us at www.whosebill.com or checkout our FAQ if you want to know more about a particular feature. If you live in a shared household, either as a student or just with friends, organising and paying the household bills can be a tiresome job. Even with the best house-mates in the world, it usually falls to one person to keep track, and involves handing money back and forth as bills arrive and are paid by different people. Others take the approach of setting up a joint account from which to pay the bills, which can work well with people you trust, but do you really want to link your financial history and credit rating to everyone you ever live with? See this forum topic if you're wondering why. There has to be a better way to take the hassle out, but keep everyone in control! 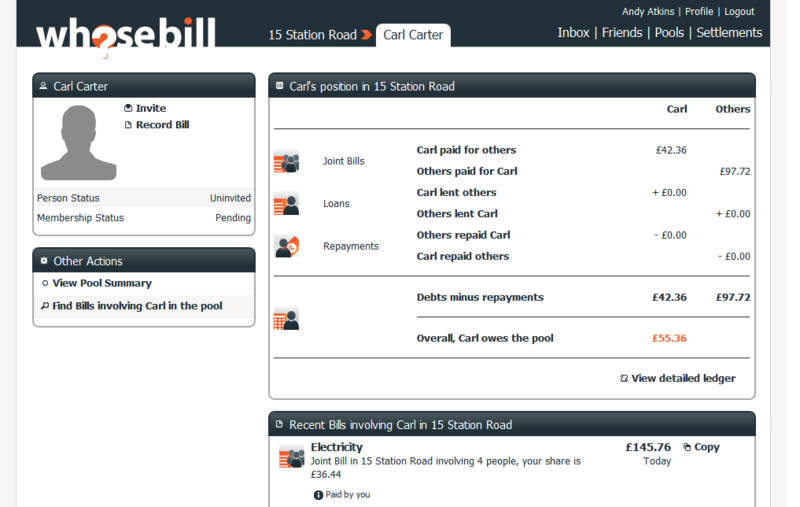 WhoseBill works like a social network, but designed for money and debts...a social debt-work...ahem. 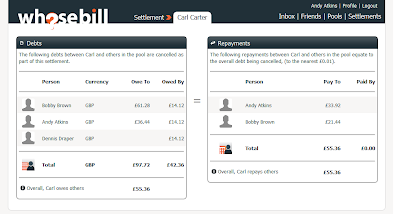 It keeps track of what each person pays for and who was involved, offsetting debts and payments to automatically calculate a position against each of your friends. 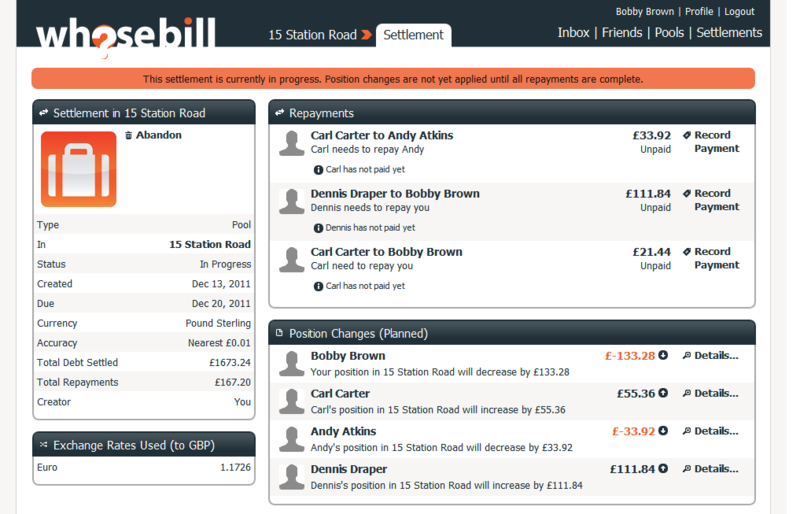 This lets you instantly see who should pay the next bill, and avoids the need to repay individual debts. But WhoseBill is much more powerful than that! 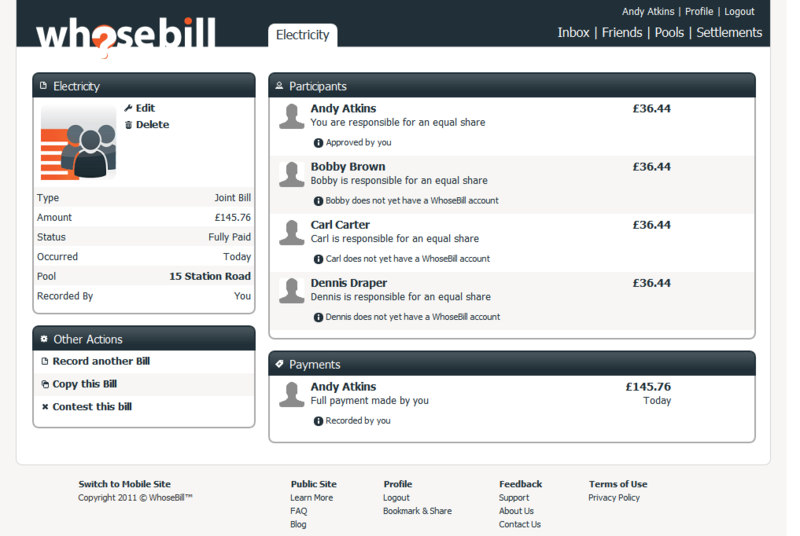 WhoseBill lets you create "Pools" for group finances, which offset bills and expenses between multiple people at once. Pools are the most efficient way to manage the bills in shared student houses or other group situations such as holidays. All payments in the pool are automatically offset between everyone in the pool, giving you a simple view on how much each person owes or is owed. 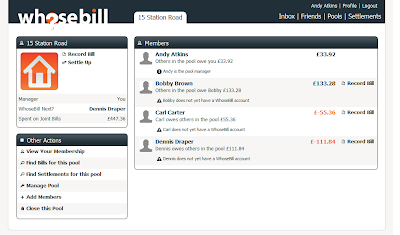 That doesn't mean to say everything has to be equally split - any type of bill can be added to a Pool and WhoseBill can work out the overall impact to each person. This means that you no longer have to worry about paying back other individuals for the bills that they pay. Instead, you only have to look at your overall position in the pool to determine whether you are ahead or behind, and of course...WhoseBill is it next? 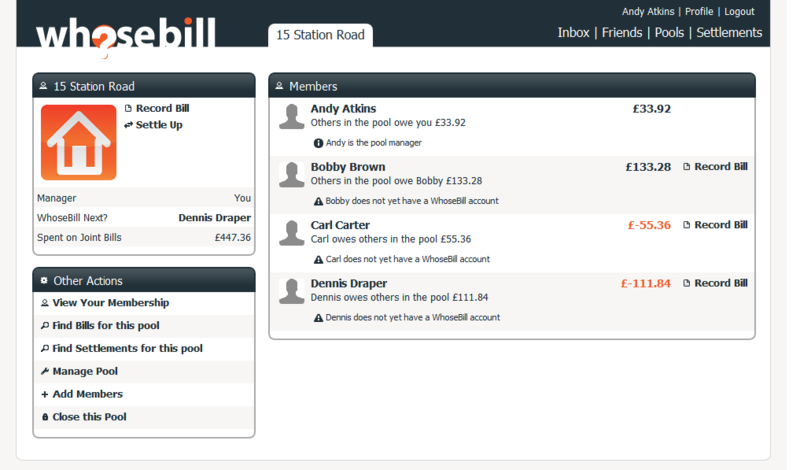 WhoseBill Pools also provide the quickest way to settle up, useful for when a house-mate changes, or everyone moves out. Simply choose to settle up the pool, and WhoseBill calculates the most efficient set of repayments that will make sure everyone has paid their fair share. It doesn't matter how many bills have been paid, or how long you have been sharing in the house, settling up can usually be performed with only 1 or 2 repayments for the people who owe money overall. And that's it! You spend less time squabbling with your house-mates about money...giving you more time to squabble about sport, religion and politics! To learn more about WhoseBill Pools, read about them in our FAQ, or signup for a free account.